We make sure that we have all the right equipment to serve our customers, even if it costs several thousand dollars to stay up to date. Most recently we purchased a Dri-Eaz flood pumper to expand our drying system equipment arsenal. So What’s a Flood Pumper? They’re much like a sump pump for removing standing water, but with an important addition. Flood pumpers include vacuum features for surface water extraction, speeding up the overall drying system. They can vacuum up large amounts of water, not just from carpet but from other flooring, walls, and ceilings as well. That’s perfect when you’ve had a broken pipe or basement flood. Portable models may have a small tank so they can handle smaller overflows, leaks, and appliance break-downs without dragging a hose through your home or business. The most recent addition to our arsenal is a Dri-Eaz HVE 3000 Portable Flood Pumper. Like other Dri-Eaz products it’s been a big productivity booster and proven to be very versatile, operating as an independent portable water extractor as well as an inline booster for our truck-mounted pumpout equipment. So it’s great for everything from carpet cleaning to flood recovery. Very compact, it goes where its competitors can’t. That portability and low noise make it a first-choice for larger homes, apartments, hotels, schools, hospitals, and offices. It features a high pumpout discharge rate of 50 gpm (gallons per minute). With 3/4 inch home plumbing you could open both taps in a bathtub and the HVE 3000 flood pumper could stay ahead of the game. It also features a clog-resistant pre-filter that can handle solids up to 1/2 inch across. The recovery tank holds 12 gallons for stand-alone use, making it our first choice quick jobs. This particular model also has a tank bypass for safely dealing with bio-contaminated water (Class 3, once called black water, that includes sewage backups, natural flooding, and long-standing water). 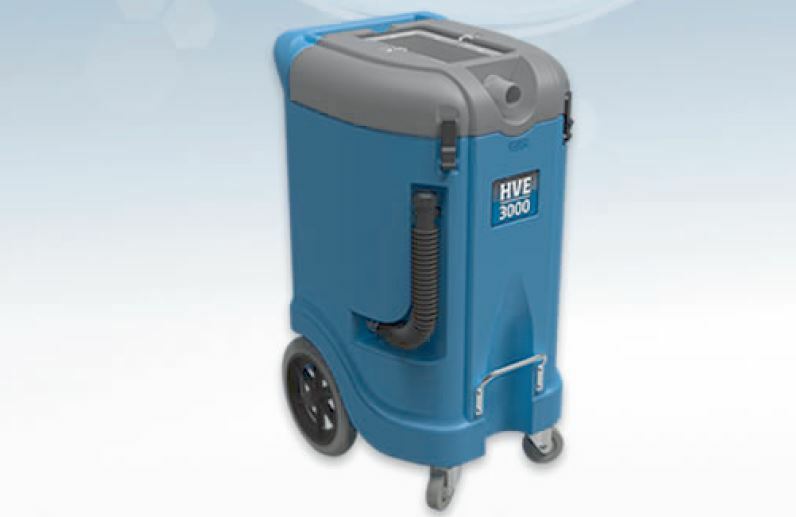 For advanced surface water extraction it has dual high-performance vacuum motors with HEPA filters, confirming to IICRC S500-215 Standard Reference Guide for Professional Water Damage Restoration (https://www.randrmagonline.com/articles/86710-six-main-changes-in-the-newly-released-ansiiicrc-s500-fourth-edition). That makes it fast and efficient, without blowing contamination into the air. Compare that to your usual shop wet-vac!